The Big Chair is now available in Blue or Green. Everyone will have a blast with this GIANT chair. Single shots or entire groups can fit on this fun and entertaining novelty. Each person receives their own 5"x7" framed photo which is printed and framed on the spot. (The big chair can also be combined with keychains and several other photo novelties. 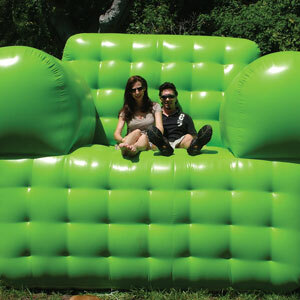 Ask us how we can incorporate the big chair into your event.) The chair stands 8'x8'. School must provide two volunteers, a covered workspace (indoor/tent/canopy), a table, a chair, a step-stool 3' - 4' tall, bottled water, and access to a power outlet. If nearby parking can be arranged that would be appreciated as well. As the chair is 8' tall and 8' wide, indoor venues must be able to accommodate the size of the chair. Want to talk with us about Big Chair Photos?